When Jorge Leyva was a 12-year-old boy living in his native country of Peru, he used to spend his days watching his uncle do metalwork in the shipyards. That was time well spent. The welding and metalworking techniques he learned laid the groundwork for becoming a sculptor with a growing reputation. 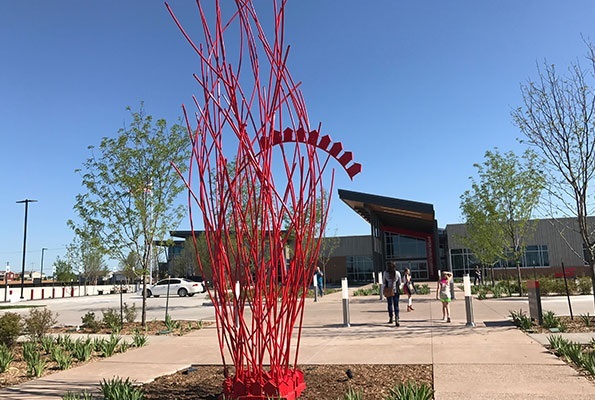 Now a Joplin-based artist, his bright red metal sculptures are scattered across town — at the Joplin Public Library, Spiva Center for the Arts, Keller Williams Realty offices,and CFI trucking company. They’re also on a couple of residential grounds. As of Memorial Day weekend, Chicago is the site of one of his pieces. Levya was among about 50 artists nationwide whose sculptural designs were selected for installation in parks and other locations in Chicago. His piece, “Weighing on the Scale of Nature,” was installed at Gladstone Park, a small neighborhood park at the intersection of six streets, giving it high traffic visibility. Leyva’s sculpture and the others accepted into the project will remain in their present locations for a year when businesses and individuals will have the opportunity to purchase and move them to permanent sites. It’s Chicago’s way of not only promoting public art but also giving exposure to the nation’s up and coming sculptors. “The recognition is wonderful because it tells me I’m working in the right direction,” Jorge says. His accepted sculpture is a 20-foot-tall piece in his signature style — metal contemporary design that blends nature and homes. 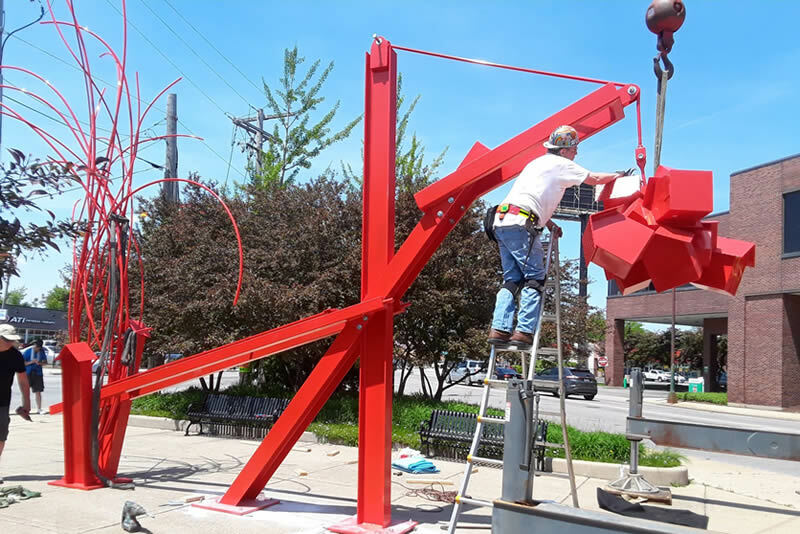 A new sculpture was installed at the plaza bounded by Central and Foster avenues and Northwest Highway on May 25. The red 30-foot long, 19-foot tall sculpture is titled "Weighing on the Scales of Nature," and features metal pillars and a cluster of red houses that hang in the air. "The piece relates to how our identities are tied to our belongings such as houses, yet we still depend so much on nature to give us places where we are allowed to exist," sculpture artist Jorge Leyva said. Leyva, who is from Joplin, Mo., said that his artistic perspective was heavily influenced by an EF5-rated tornado that destroyed much of the city on May 22, 2011, killing 158, injuring about 1,150 and financially ranking as the costliest tornado in U.S. history. "After the tornado, suddenly social and political issues seemed not as important to me. We lost belongings, identity, people had to rebuild," Leyva said. "But in a strange way it was a rebirth, of sorts, for those lucky to make it through. It reminded me that things are impermanent." The sculpture will be on display for a year as part of the Chicago Sculpture Exhibit. 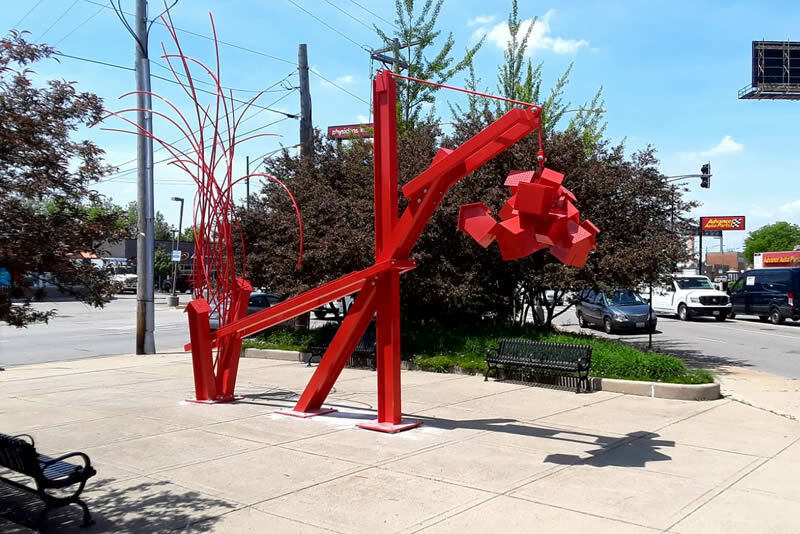 It is one of the nonprofit organization’s 56 sculptures scattered in public sites through downtown, north and northwest neighborhoods each spring. Once again, Joplin is finding a place at the Missouri Arts Council state awards ceremony at Jefferson City. 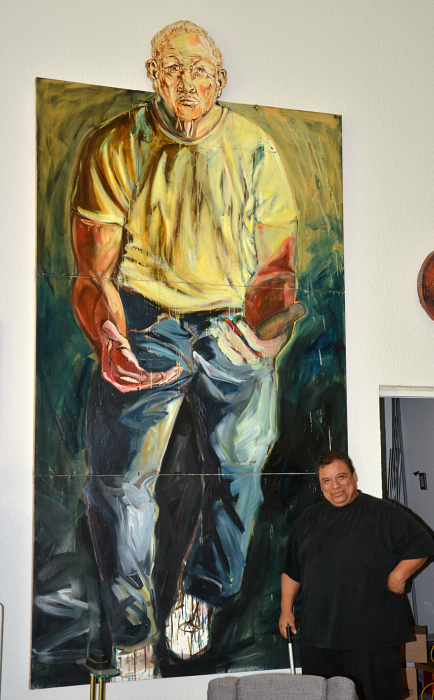 The artwork of Jorge Leyva, the community’s most widely known sculptor and painter, was selected for the signature image of the 2018 Missouri Arts Awards poster. The work also appears on the invitation and the programs of the awards ceremony, scheduled for Wednesday in the state Capitol rotunda. 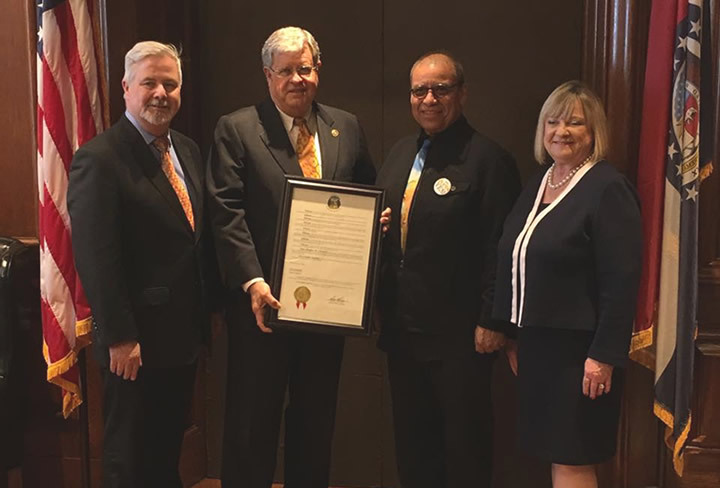 Leyva joins five other local arts leaders and organizations, including the city of Joplin, that have been honored since the MAC recognitions were established in 1983. The awards recognize people, organizations and communities that have made lasting contributions to the cultural and artistic climate of the state. Each year, awards posters, invitations and programs feature signature artwork that is selected by a state awards nominating committee. The winning artwork represents an artist who has built both creative and civic stature. It’s a unique sight to see in Joplin: the expansive green lawn in front of Jorge Leyva’s home dotted with a handful of large metal sculptures. Some of them are brightly colored, while others stand gray and raw, awaiting the time when they, too, will be painted into life. Like flowers in a garden, these exquisite sculptures bloom in their own time, in their own way. “I believe in beauty and in beautifying the place where I exist,” says Jorge. And he doesn’t want to keep this beauty to himself. He wants others to see, feel, and experience the art themselves, which is why he’s opened his sculpture garden to the public – for free. There aren’t many parks or other public spaces in town where people can go to see artistic pieces like fountains and sculptures. But that is beginning to change, and Jorge is playing a big part of the public art movement in Joplin. His mission is to educate his town about “the importance of having something visual where people can participate and feel alive.” He recently dedicated a piece that he created for the Joplin Public Library called “Revering the Phoenix Effect,” which represents how Joplin rose from the dust after the tornado. If Jorge Levya’s garden gate is open, the public is welcome to come inside. It’s not any ordinary garden, and it’s not intended to be a secret garden either. Levya wants you to visit. The Joplin artist and sculptor has created a sculpture garden that includes five or six works in Levya’s front yard at 1305 E. Vandalia St. in Joplin. It’s a labor of love by a talent who believes sculpture as art is lacking in the Joplin area. And he’s right. For all the many wonderful art venues and murals Joplin has, sculptures are far and few between, although there are efforts, including a new installation soon to be finished in Mercy Park. If you have ever walked the outside trail at Crystal Bridges in Bentonville, Arkansas, you soon understand how captivating sculptures can be. Leyva plans to change the front yard view from time to time, cycling through hundreds of pieces to be on display or for sale. 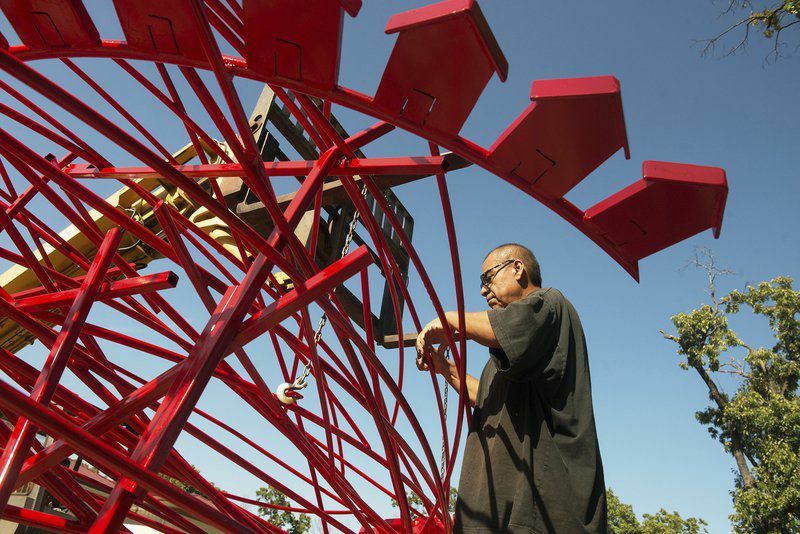 Jorge Leyva, a sculptor and painter in Joplin, is preparing to showcase his latest works in a new way — by essentially transforming his front yard into a sculpture garden that he will invite everyone to see. "I love when people are able to walk around the works in grass," he said. "I think it attracts a lot of camaraderie, a lot of community." The sculptures, five or six in total for now, will be on concrete pads in the front yard at 1305 E. Vandalia St., Leyva's work studio and home. The public will be invited to walk through his yard — as long as his front gates are open — and view the artwork in a respectful, responsible manner. 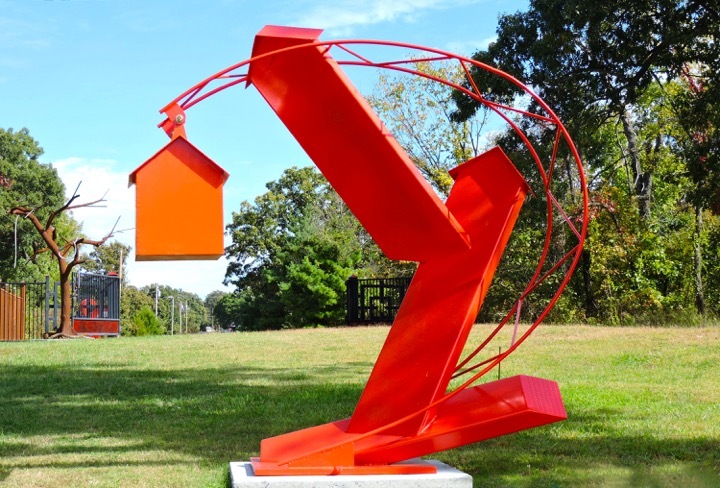 Leyva said he felt compelled to create such a space for his works because although public art has taken hold in Joplin in recent years, he believes that sculptures as a public art form are largely lacking in the area. He noted that big cities often boast large sculpture gardens where residents can gather and talk about the arts and culture. Sometimes I’m surprised to learn about “big city” type businesses or attractions that exist right here in our little neck of the woods. Other times, I’m simply blown away. This was the case last week when I walked through the doors of artist Jorge Leyva’s studio. My eyes instinctively lifted upward, absorbing the vibrant colors of the enormous paintings hung on the soaring walls. Was I still in Joplin? Certainly not, because the feast for the eyes that surrounded me was more likely to be viewed at a gallery in New York or Los Angeles. Luckily for us, this talented artist chooses to live and work in our city. And, even luckier for us, he welcomes visitors into his studio so they can see his work. 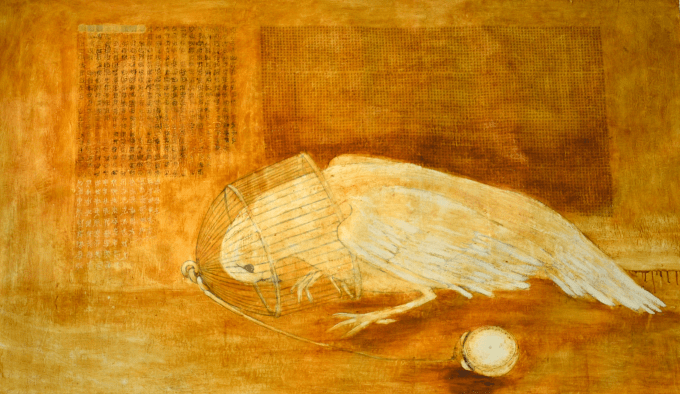 Contemporary artist Jorge Leyva invites visitors to see his finished work as well as to witness his work in progress. 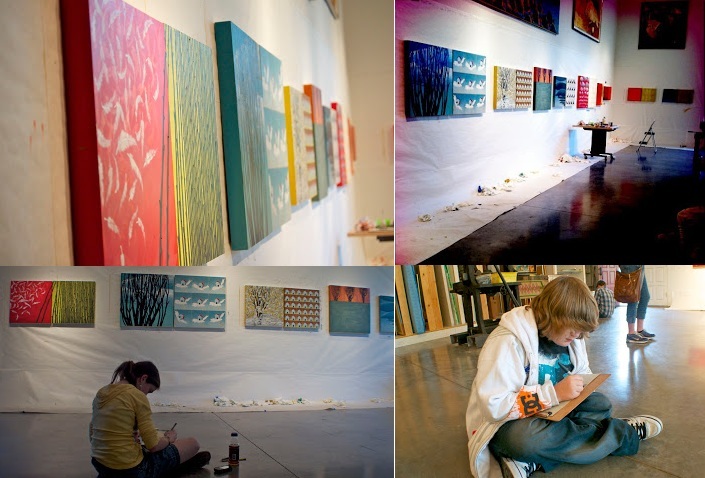 Metal sculptures and mural-sized paintings fill this full-time studio. From figurative paintings with metaphors for life, to the cultural influences of a rich and colorful background, his works are universal. Call to schedule an appointment to visit the studio. JOPLIN, Mo. - The artist who created the piece is saying "Thank You" to those who helped fund the project in a unique way. Joplin artist, Jorge Leva created the "Revering the Phoenix Effect" sculpture as a way to honor the city's rebirth following the 2011 tornado. Leyva has created other works of art in Joplin, including murals dedicated to remembering the 2011 tornado. My name is Makenzi and last week we went to visit Jorge Leyva’s art studio. It was a great experience to visit a local artist. We all had the privilege to walk though and talk with Jorge. Towards the end of our visit we all sat down in his studio and did different sketches. We came together when we all had finished sketching and Jorge looked at all of our work. He told each person what he thought of their piece or pieces. I drew a candle surrounded by darkness, to show that no matter how much darkness there maybe in the world the light will always win. The main concept was to say that God will always stomp out that darkness. Jorge told me that by my drawing he could tell I had a lot of hope in life and that I seemed like someone who wanted to change the world. All which is true. I really enjoyed going to his studio and seeing his art. He is a really cool and funny guy and I’m glad I had the privilege to go. 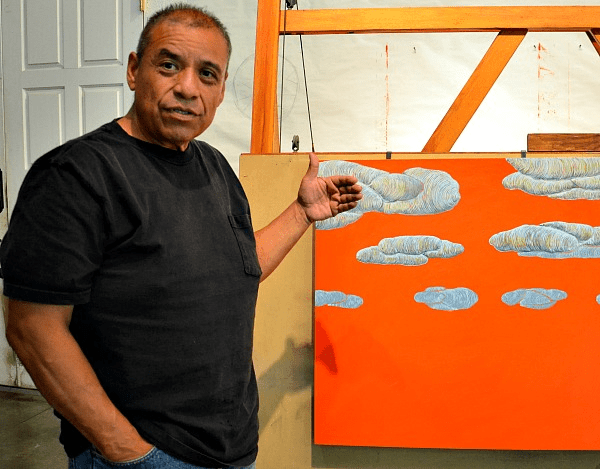 Jorge Leyva keeps a small collection of work by his contemporaries in the back of his studio. The short hallway between the office and his break room is decorated with paintings, pottery, sculptures and etchings from area artists Leyva admires.